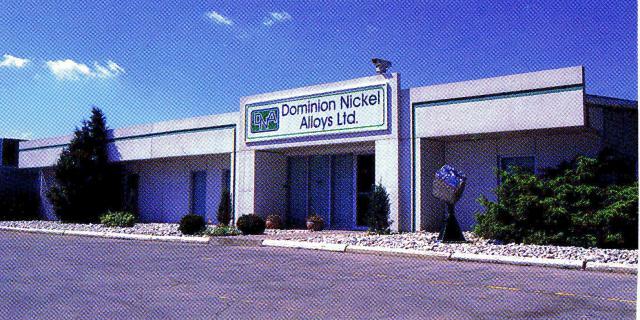 Beginnings... Dominion Nickel Alloys Ltd. first opened its doors for business in Montreal in 1969. The company founder, Frank Fleisher, started the business with his life savings and a dream to someday become a force in the scrap metal recycling industry. Through his unyielding commitment to sound and honest business practices and old-fashioned hard work, Frank quickly built a reputation of integrity in the industry. As a result, his business grew. So much so, in fact, that by 1979 the business had outgrown its Montreal facility. Early Growing Years... Oakville, Ontario was chosen as the business’s new home, primarily because of its ready highway access to Toronto and U.S. border cities, as well as its strong workforce base. Within 15 years, the company had outgrown its 5-acre site and 40,000 square foot manufacturing facility in Oakville. It was time to seek out a facility that could both sustain the current level of business activity, and accommodate management’s plans for future growth. With a desire to maintain the geographical and workforce advantages offered by the Oakville site, Dominion’s management team set their sights on a 10-acre site with a 75,000 square foot manufacturing facility in nearby Burlington, Ontario. Sustained Growth... Following acquisition of the new site in January 1995, the company refurbished and updated the existing buildings and turned the site into a modern scrap metal recycling facility with state-of-the-art equipment. Operations commenced in July 1995. Another 10-acre expansion was completed in 2000, bringing the total site size to 20-acres. The current site is well positioned to effectively sustain business activities today, and has the potential to accommodate continued growth in the future.